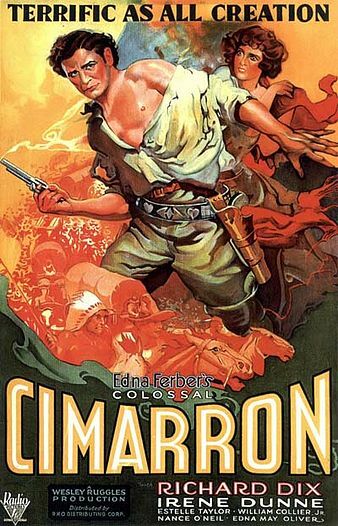 Named after the novel of the same name, Cimarron is the oscar-winning film that was RKO studio’s most expensive film to date. It was the first film to receive more than six academy award nominations. It was the first western to win Best Picture at the Academy Awards, and it was filmed on a large ranch in 1930 outside of Los Angeles. The plot follows a young man during the Oklahoma land rush. It trails his adventures as he falls in love and marries a young woman and they move to the small western town of Osage. The town grows due to the oil boom and the controversial presence of native Americans on the land causes friction as movement further west continues. Yancey, the main character, starts a muckraking newspaper. They have children together and get involved in local politics until Yancey abandons his wife and children in search of new adventures. Cimarron is a poor film loaded with tired clichés and spotty acting. As a major award-winning film, Cimarron is one of the first in a long line of movies, once honored by the Academy for their day, but now are nearly forgotten. If I had the opportunity to do it over, I would not have seen this film and would not recommend it to lovers of classic cinema.